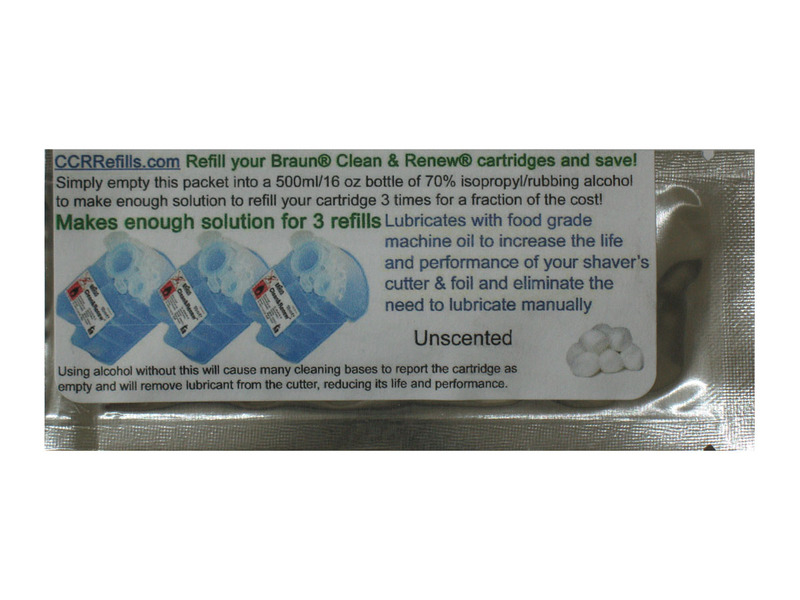 CCRRefills.com - Refill solution to refill your Braun® Clean & Renew® CCR cartridges and save. Simply empty the contents of one of these refill solution packets into a 500ml or 16 oz bottle of 70-99% isopropyl/rubbing alcohol (available in drug stores for about $2) to make enough solution to refill a Braun® Clean & Renew® cartridge 3 times. 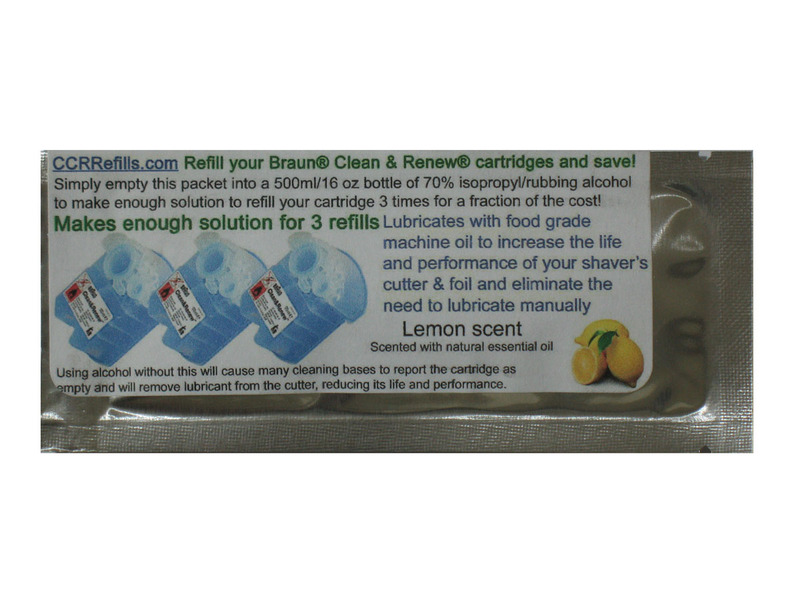 Lemon refill solution packets for Braun® Clean & Renew® CCR cartridges. Contains food grade machine oil for lubrication and scented with natural essential oil. Each packet makes 3 refills. Requires one 500ml or 16oz bottle of 70-99% isopropyl/rubbing alcohol per packet. 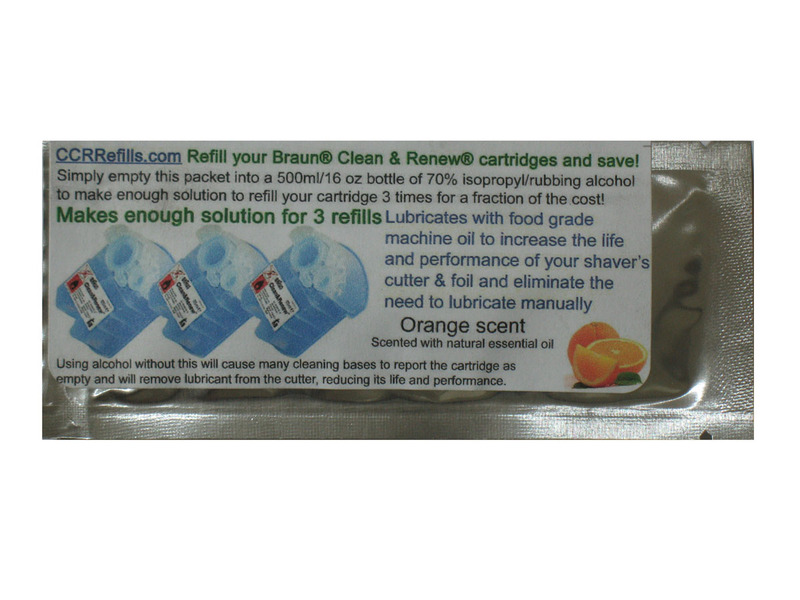 Orange refill solution packets for Braun® Clean & Renew® CCR cartridges. Contains food grade machine oil for lubrication and scented with natural essential oil. Each packet makes 3 refills. 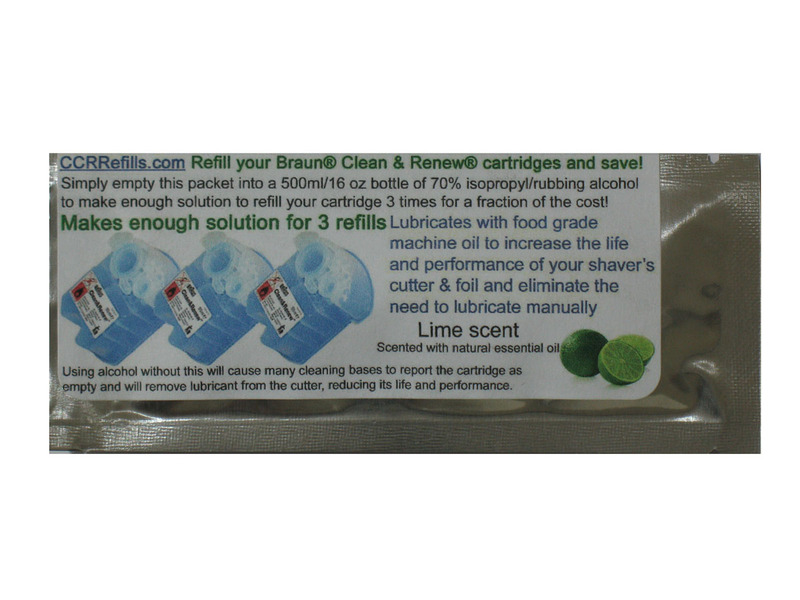 Lime refill solution packets for Braun® Clean & Renew® CCR cartridges. Contains food grade machine oil for lubrication and scented with natural essential oil. Each packet makes 3 refills. 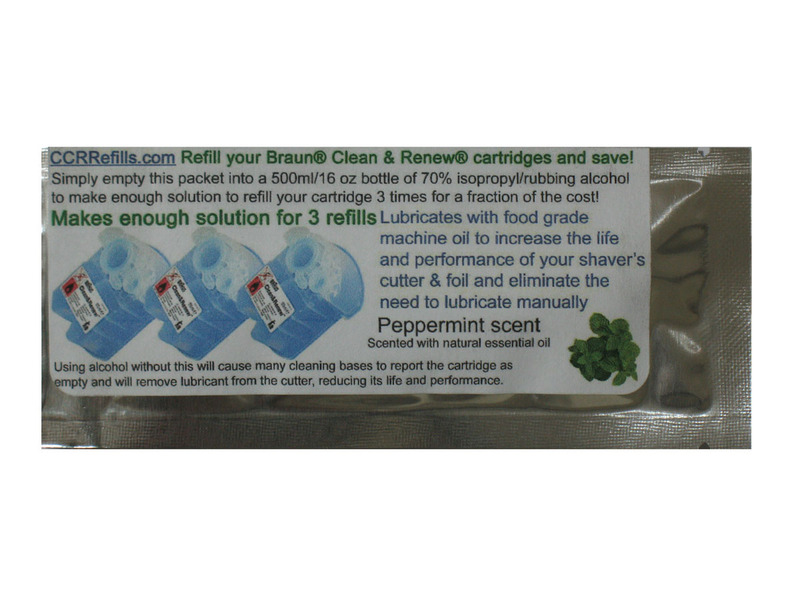 Peppermint refill solution packets for Braun® Clean & Renew® CCR cartridges. Contains food grade machine oil for lubrication and scented with natural essential oil. Each packet makes 3 refills. 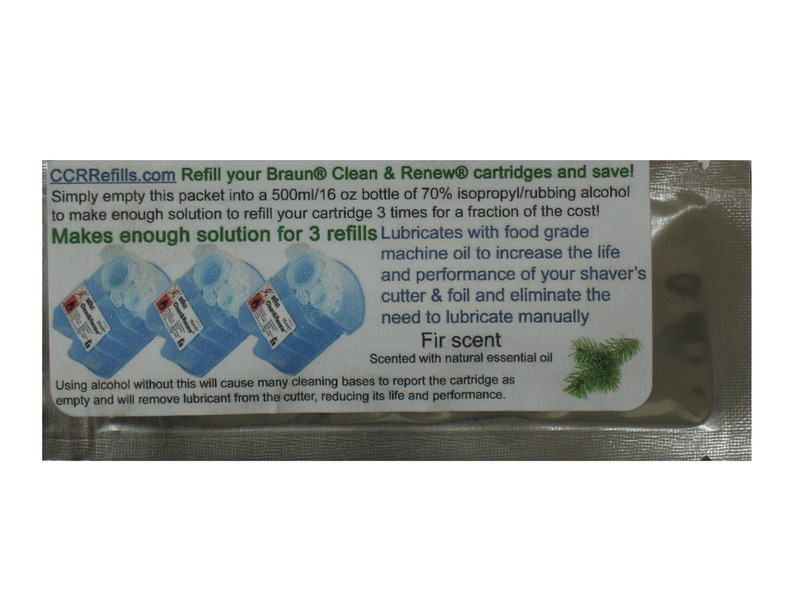 Fir (Christmas Tree) refill solution packets for Braun® Clean & Renew® CCR cartridges. Contains food grade machine oil for lubrication and scented with natural essential oil. Each packet makes 3 refills. Unscented refill solution packets for Braun® Clean & Renew® CCR cartridges. Contains food grade machine oil for lubrication. Each packet makes 3 refills. CCRrefills and its refill solution packets are not affiliated with, guaranteed, or endorsed by The Gillette Company or Braun Gmbh Corp. Please contact CCRrefills directly with any product questions or concerns. The Braun® and Clean & Renew® trademarks and images of the Braun® Clean & Renew® products are the intellectual property of The Gillette Company, and use of this intellectual property does not imply affiliation, guarantee, or endorsement by The Gillette Company or any of its affiliates.